Angel #19 will arrive in stores on March 18 from IDW Publishing. The issue is written by Kelley Armstrong, with art by Dave Ross and covers by Gabriel Rodriguez and Nick Runge. "As Angel and the remaining survivors from their sojourn to Hell attempt to rebuild their lives and find purpose once again, they must also contend with the threat of a vengeful Lord, a mysterious cat-changer and a winged being from beyond..."
Angel #19 will be 32 pages and will cost $3.99. G.I. Joe: Cobra #1 will arrive in stores on March 18 from IDW Publishing. The issue is written by Christos Gage and Mike Costa, with art by Antonio Fuso and covers Howard Chaykin and Fuso. "His name is Chuckles. He's the Joes' top undercover agent. And he's just infiltrated a top secret, highly organized terrorist organization... one the Joes aren't familiar with... one with a snake motif. As Chuckles is pulled deeper and deeper into the dark underbelly of Cobra, where one misstep means death, can he pull off the ultimate deception and bring them down from within?" G.I. Joe: Cobra #1 will be 32 pages and will cost $3.99. Star Trek: Crew #1 will arrive in stores on March 18 from IDW Publishing. The issue is written by John Byrne, with art and cover by Byrne. "Eight years before 'The Cage,' the young woman who would become the Starship Enterprise's 'most experienced officer' was a lowly cadet assigned to the shakedown cruise of an uncommissioned starship. But that supposedly pedestrian mission may prove the most dangerous of her life. 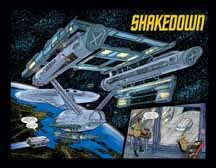 Byrne begins an all-new, six-part mini-series torn from the Federation�s beginnings!" Star Trek: Crew #1 will be 32 pages and will cost $2.99. Ghost Whisperer: The Muse #4 will arrive in stores on March 18 from IDW Publishing. The issue is written by Barbara Randall Kesel, with art by Adriano Loyola and covers by Brian Miller and photo. "Melinda discovers what caused all those artists to die, but the secret of the Muse may still mean the death of Melinda's new artist friend! Based on the CBS television series starring Jennifer Love Hewitt!" Ghost Whisperer: The Muse #4 will be 32 pages and will cost $3.99. Transformers: Revenge of the Fallen Movie Prequel: Defiance #3 will arrive in stores on March 18 from IDW Publishing. The issue is written by with J.M. DeMatteis, with art and cover by Mike Cavallaro. "The second official prequel to this summer�s Transformers movie continues! Guided by a mysterious entity, Megatron aims to search the vast reaches of space in order to return a legend of Cybertron and carry out a plan of conquest. With Cybertron in a state of disorder, the fate of the planet may lie with the inexperienced and outnumbered Autobots." Transformers: Revenge of the Fallen Movie Prequel: Defiance #3 will be 32 pages and cost $3.99.